THIS EPISODE IS BROUGHT TO YOU BY KATHMANDU, THE SUSTAINABLE TRAVEL & ADVENTURE BRAND. Environmental explorer, scientist and Member of the Order of Australia, Tim Jarvis has an important message about climate change. In 1992 at the time of the United Nations Framework Convention on Climate Change, 25 mountains at the equator (that is at zero latitude) had a glacier. Most of them will be melted completely away within 25 years. This is our last chance to tell their stories. Enter his project 25-Zero, which aims to "highlight the urgency of action, and the enormity of the result of inaction." "People are a little bit bored of hockey-stick curves, Al Gore-style information," he told the Sydney Morning Herald. "I'm trying to find content which is different and interesting for people where they might actually think, 'Wow, I didn't know there were any glaciers at the equator'." Tim relishes an almost insurmountable challenge. In 2007 he retraced a journey made in 1913 by a polar explorer by the name of Sir Douglas Mawson, and Tim did with the same type of 100-year-old gear - including hobnail boots and starvation rations - that those guys had to deal with. Wait till you hear him tell this story. Mawson lost his kit had to sleep in a makeshift tent, at one point was driven to eat his dogs...and apart from the dog bit, Tim copied that entire ordeal. Breakfast is served, sir: it's a boiled sweet and some lard. Not content with that, a few years later, he retraced another ridiculously hard slog through the snow, this time that of Sir Ernest Shackleton’s 1916 Antarctic expedition which is regarded as one of the greatest survival journeys of all time. Again Tim and his team, obsessed with authenticity, used the same type of period equipment, and clothing. Let’s just say this was pre-Gortex. I was actually relieved to find out that Tim is a Kathmandu global brand ambassador. More than that, he is involved in the design of Kathmandu’s XT Series, they call it Engineered to Endure. Like Tim! The Arctic and the Antarctic are the inverse of each other. Antarctica, or the south pole region, is a continent which is covered with an immense ice shelf. The Arctic region, on the other hand, is mainly located in the north polar ocean (it includes several large islands such as Greenland and Victoria Island, and others that boarder countries like Russia, Canada, Alaska and Greenland). The north polar ocean is covered by year-round ice caps that generally extend far south during the Arctic winter and are made up of around 16 million square kilometres of ice. Polar bears live solely in the Arctic areas, while penguins are found in the southern Antarctic regions. On that note, Paul Nicklen's photographs of plight of the polar bear are impossible to forget. Sea level rise. Tim says, "In the Arctic the change is very easy to see, because essentially if you want to try and get to the north pole you've got to walk across what should in theory be frozen ocean, even in the summer. Except now it's not. We will have ice-free Arctic ocean by the mid 2030s." Globally, "You only need 50 centimetres of sea level rise for it to be catastrophic." And at the other end...Via SMH, in January 2018: "Antarctica's ice sheet is melting at a rapidly increasing rate, now pouring more than 200 billion tonnes of ice into the ocean annually and raising sea levels half a millimetre every year." Earth's albedo. "Sunlight is the primary driver of Earth’s climate and weather. Averaged over the entire planet, roughly 340 watts per square meter of energy from the Sun reach Earth. About one-third of that energy is reflected back into space, and the remaining 240 watts per square meter is absorbed by land, ocean, and atmosphere. Exactly how much sunlight is absorbed depends on the reflectivity of the atmosphere and the surface." Read more on the NASA website. A giant iceberg broke off from Larsen C in Antarctica in July 2017. At 5,800 sq km it is one of the largest icebergs ever recorded. Read all about it here. Ernest Shackleton was an Anglo-Irish Antarctic explorer. "In 1914, he made his third trip to the Antarctic with the ship 'Endurance', planning to cross Antarctica via the South Pole. Early in 1915, 'Endurance' became trapped in the ice, and ten months later sank. Shackleton's crew had already abandoned the ship to live on the floating ice. In April 1916, they set off in three small boats, eventually reaching Elephant Island. Taking five crew members, Shackleton went to find help. In a small boat, the six men spent 16 days crossing 1,300 km of ocean to reach South Georgia and then trekked across the island to a whaling station. The remaining men from the 'Endurance' were rescued in August 1916. Not one member of the expedition died." Via the BBC. "Sailing a 100-year-old boat through the roughest ocean in the world, trying to land it on South Georgia Island's treacherous coastline and then climbing across the island with virtually no gear was not easy." - TIM JARVIS ON RECREATING SHACKLETON'S JOURNEY. One of Australia’s greatest Antarctic explorers, Douglas Mawson was responsible for one of the most extreme survival stories of all time. "As leader of the Australasian Antarctic Expedition, over almost three years, he charted the Antarctic coastline, explored sub-Antarctic treasures such as Macquarie Island, and travelled more than 500 kilometres inland, collecting geological and scientific data. 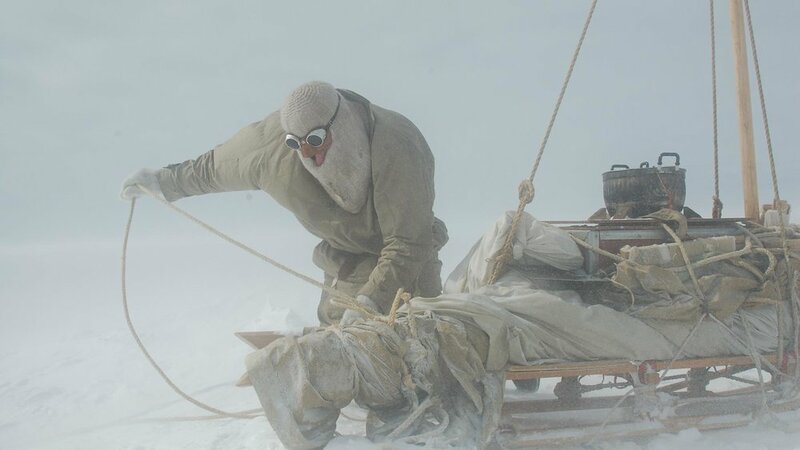 During one of these inland journeys in 1912, Mawson’s two companions died, leaving him alone, seriously malnourished and with severely damaged feet, more than 320 kilometres from base. Despite falling into a crevasse and having to haul himself out, Mawson eventually staggered back to base 30 days later, only to discover that his ship had left for home just hours before. It meant another winter in Antarctica." Via Australian Museum. Climate change. Tim reminds us that we're all in this together. 'THERE'S NO ONE ELSE WHO'S GOING TO SOLVE THIS PROBLEM BUT US. WHEN AN INDIVIDUAL SAYS, "OH IT'S TOO BIG, TOO OVERWHELMING, WHAT CAN I DO?" I ALWAYS REMEMBER THAT ANITA RODDICK LINE, "IF YOU THINK YOU'RE TOO SMALL TO HAVE AN IMPACT, TRY SLEEPING WITH A MOSQUITO IN THE ROOM." EVERY INDIVIDUAL JUST HAS TO STEP UP AND MAKE SOME CHANGES IN THEIR LIVES." - TIM JARVIS ON CLIMATE CHANGE. Kathmandu's sustainability strategy. The brand embeds sustainability into all stages of its supply chain, including working conditions in factories, sourcing sustainable and ethically produced materials, eliminating restricted chemicals and reducing waste. Kathmandu achieved an ‘A’ in the 2018 Ethical Fashion Report, and was the first company in the southern hemisphere to receive accreditation from the Fair Labor Association (FLA). The FLA is a collaborative effort of universities, civil society organisations and socially responsible companies dedicated to protecting workers’ rights around the world. Read more here. - Reduce carbon emissions by 20% by 2020. What about microfibres? CAN'T WE JUST BAN THEM? Kathmandu says: "You may have heard about how microbeads have been banned from cosmetics.That was relatively easy. These plastic exfoliants can be easily replace by organic compounds like sugar, sand or ground seeds. For the apparel industry, things aren’t quite so simple. The University of California study concluded that elimination of synthetic textiles was “extremely unlikely” and said that mitigation is the way to reduce microfibre pollution....Our entire industry needs to face the microfibres problem and we can be more effective in partnership than in our own brand silos. The Outdoor Industry Association Sustainability Working Group has a vision to create products that do no harm. Microfibres is on their list of priority issues. They have set up a Microfibres Task Force to investigate the problem further and look for industry wide solutions. SGS has developed a new testing service that will help us understand if some products shed more microfibres than others. Early research shows that high quality fabrics shed fewer fibres, so there may be some choices we can make when choosing fabrics that will make a difference. As an industry, we may also be able to put pressure on textile manufacturers to develop fabrics that shed fewer microfibres." Read more here. Wool. Kathmandu is part of the collaborative industry group developing the Responsible Wool Standard (RWS). Recycolor blends recycled cotton fibres with new ones, without needing water or chemicals for dyeing. To make it cotton, scraps are gathered up from factory cutting tables, sorted by colour, and then fed into huge stripping machines that break the fabric back down into their original fibres. These broken down fibres are usually too short to spin, so they are mixed with virgin cotton to create a stronger finished yarn. The resulting fabric has a distinctive marle-look that needs no dyeing. Clever. I mention my plans to sit on the sofa imagining adventure while wearing one of Kathmandu's Khusi beanies, hand-knitted in Nepal by women's collectives, and supports the knitters to be more independent. See above. Aren't they cute? How to make a more sustainable garment? Kathmandu's Earth Hoodie is made from 70% recycled plastic bottles, 30% ethically sourced, traceable cotton featuring a supple fabric dyed with raw waste materials from agricultural crops (including nutshells, almond shells, rosemary, horse chestnut, saw palmetto and beetroot). Tim wears the XT Series on his adventures. Kathmandu down jackets use Responsible Down Standard (RDS) certified down – ensuring it’s traceable and ethically produced. The Edwardian equivalent of the anorak was made from waxed cotton and known as a Burberry (after the British house that made the best ones). Layering up jumpers underneath was a requirement (imagine how they felt when they got wet). Tim made a friend of the balaclava, and packed his mucklucks - soft boots worn by Eskimos, often lined with fur and usually made of sealskin or reindeer skin. He hiked in heavy leather hobnail boots. He slept in a reindeer skin sleeping bag, which he had especially made. Toasty! Not. He slept on the snow because Mawson lost his tent.